Another obsolete film format is the 828 format. It hasn't been produced in a very long time but there are some ways to modify 120 format film and use this instead. Tom Desaulniers has sent some information, reproduced below, which may prove of interest to those who wish to try out, if not use regularly, their 828 rollfilm cameras. Imagine holding a roll of 120 film in your left hand between index and thumb. Turn the hand so that your thumb is closest to you and index finger is away from you. Now look down the axis of the film spool. Looking at the roll so your thumb is closest, turn the roll (end for end if necessary) so that rolling it anti-clockwise would roll the film up, not unroll it. The end closest to you I call the bottom of the roll. You will keep the end closest to you and you will keep 35mm width of it. I made a channel shaped box, like a carpenter's miter box that is exactly as long a the distance between the insides of the 120 spools. I cut a saw slot in the miter box 35mm from one ends. I use a small fine tooth hand saw, like a jeweler's saw. I cut off and keep this 35mm wide half. The numbers left on the paper will line up with the green window on the back of the camera. 1 thru 16 exposures. You may only be able to wind about 13 or 14 exposures before the reel gets too large, but the numbers will work. Tom included some further notes from another 828-film user, Mark Hahn. cut the 120 film in your miter box. in the dark first cut the leader to half its original length and cut new tang (just a point will do). unwind the film from the spool. cut 4 inches off the end of the film. cut the paper tail to half its length from the new end of film. wind the film back onto an 828 spool until you get to the tape. continue winding until you are at the end of leader. you now have a new 828 roll of film with 14 exposures! 16 exposures only worked with some crude spools that I made myself that had a narrower spindle. As an aside, I have read that the lenses on these cameras are nearly equal to an Ektar which would suggest a theoretical performance that is equal to say an early Leica. So far I don't think I've seen that, but I really love these cameras. I have had excellent luck cutting the off the top 35mm off a roll of 120 EFKE 100 film (using a table-top scroll-saw), then snipping off about 8" from both ends of the leader and re-spooling onto an 828 roll. You can then use the 645 numbers which just happen to line up with your red (or green) window. You get 16 exposures this way. I have found that TMAX100 is too thick and results in a too thick spool causing the film to rip when you wind it through; you will probably have to come up with a scheme to shorten it down to 12 or 14 exposures if you use this film (Charles had similar problems with some other film). EFKE film is actually quite nice in this large format so I am just going to stick with it. So far I have found shooting my f4.5 Bantams to be quite enjoyable and the cameras are very small (~the same size as a Minox 35). Also, my local lab will develop the film for standard 35mm prices. The latest one I bought has the neck strap which is a really nice feature ... just wish I had a few filters that fit. At less than $10 these cameras are a real bargain and tons of fun ... the photos are quite sharp ta-boot. Given that the 28x40mm negative from 828 film is about 30% larger (in area) than "normal" 35mm, that the lenses on the higher-end Bantams, such as the f/4.5 model, the Flash Bantam and the Bantam RF are certainly no slouches, that a folded Bantam is about the same size as many modern "Advanced Photo System" cameras and that these cameras can be had for relatively little money, makes the concept of using them quite attractive. Let's not forget at this point the Pony 828, which has a similar specification to the Bantam f/4.5, or indeed the UK-made Bantam Colorsnap models, which have fine lenses, if a rather more restricted range of shutter speeds. None of this, of course, means that the more basic Bantam cameras cannot be used, within their limitations. 100ASA film and a sunny day will return very acceptable pictures from any camera in good working order. Some insights into this may be found on my Box Camera FAQ page. As the original 828 film only gave 8 exposures per roll, (though Kodachrome II at least was later available on a 12-exposure roll), a 14 or 16-exposure roll could be considered an improvement. Being 35mm wide, the film can easily be processed by equipment used for "normal" 35mm film, though printing a full-frame negative may be a little more challenging, as may getting slide-mounts to suit. If you do not develop your own film, ensure you get the 828 spools returned. If you like to have exact measurements to work to, an original 8-exposure roll of Kodacolor-X contained 17" (43cm) of film mounted on 31.5" (80cm) of backing paper and an original 12-exposure roll of Kodachrome II contained 24" (61cm) of film mounted on 38.5" (98cm) of backing paper, the film being fastened 8" (20cm) and 7.5" (19cm) from the beginning of the backing paper respectively. Note that having cut down and shortened a roll of 120 film, the original printing with the film details may no longer be available, so it may be wise to carefully mark each roll as to its contents if there is any risk of confusion, both at the beginning and immediately it has been removed from the camera. Should more than one roll be used in a "session", arrangements will also need to be made for fastening the end of the roll to prevent unwinding, as the original gummed paper will have been lost when the backing paper was shortened. Should the stock you are using be too thick for a normal 16-exposure roll, if one was prepared to load and unload the camera in a darkroom or changing bag, the paper leader and trailer could be cut to an absolute minimum, thereby possibly allowing the full 16-exposure length to be wound onto the 828 spool. Film wound like this would obviously need to be stored in a lightproof container, suitably annotated as to whether its contents were exposed or not. Tim Verthein managed to cram the complete length of a cut-down roll of T-MAX 100 onto an 828 spool and has posted some of the impressive results from his Flash Bantam on his website. The rest of Tim's web-site is well worth a visit, he is a man of many interests! Should anyone be tempted to consider cutting down some 127 film, be aware that although the film length is exactly correct for a 12-exposure roll of 828, the numbers on the backing paper are likely to be too close to the edge of the film to be visible in the frame-number window on an 828 camera. If all the above sounds a little too involved, both Film for Classics and Central Camera Company can supply 828 film. For their contact details please check the finding film section on this website. Shown below is the masking plate that fits into the film-gate on some of the 620 film 6 x 9cm-format cameras, and the two spool adaptors. 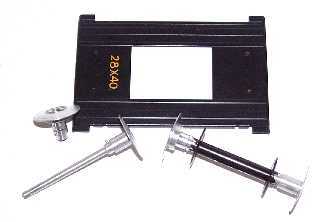 This specific adapter was supplied with some Kodak Pathé cameras to enable the use of 828 film in 620 format cameras. The adaptor on the left is disassembled, that on the right is fitted with an empty 828 spool. These adaptors differ completely to those supplied for the US-made Tourist and Reflex cameras.